NO CALL OUT FEES...NO VAT...NO "HIDDEN" COSTS. THE BEST PRICES IN THE AREA,GUARANTEED. 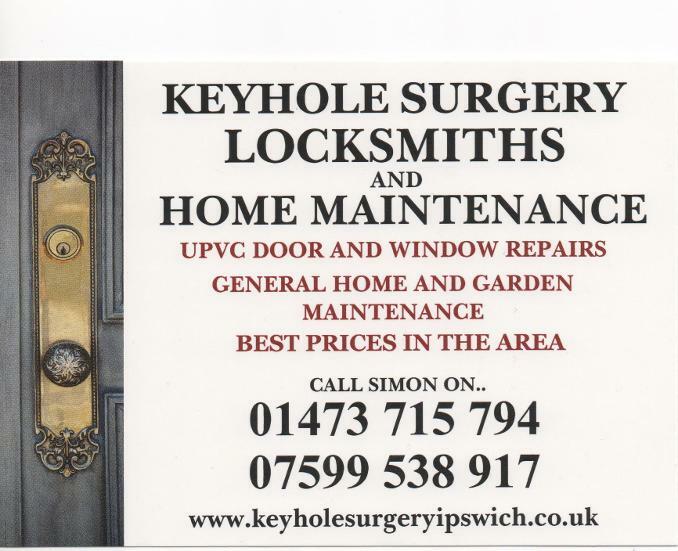 GET 2 OR 3 QUOTES THEN CALL SIMON AT KEYHOLE SURGERY!! WE WILL BEAT ANY QUOTE BY ANY OTHER LOCKSMITH IN THE AREA. UPVC MULTI POINT LOCK SPECIALISTS. FREE HOME SECURITY SURVEYS.CALL FOR DETAILS. IPSWICH BASED (NOT NATIONAL CALL CENTER). LOCKS TO SUIT ALL BUDGETS. COVERING 25 MILE RADIUS OF IPSWICH.